Do you Dream of Cotton Candy Themes? 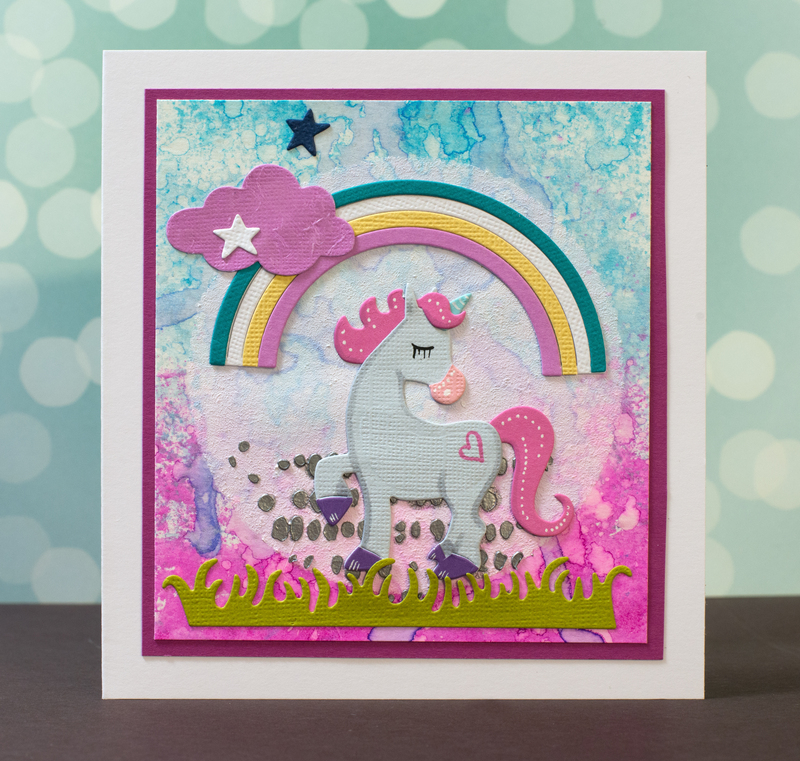 “Roll me in fairy dust, and call me a unicorn!” To lift my mood and to make a rainy day sparkle I took out my unicorn die set and started crafting with soft pastel colors and candy color papers. Die-cut collages are the perfect way to utilize little scrap paper pieces; I have one small box in which I store leftover pieces of solid color papers; in many cases, you only need a little piece of a specific color, and having a scrap paper box has proven to be handy. 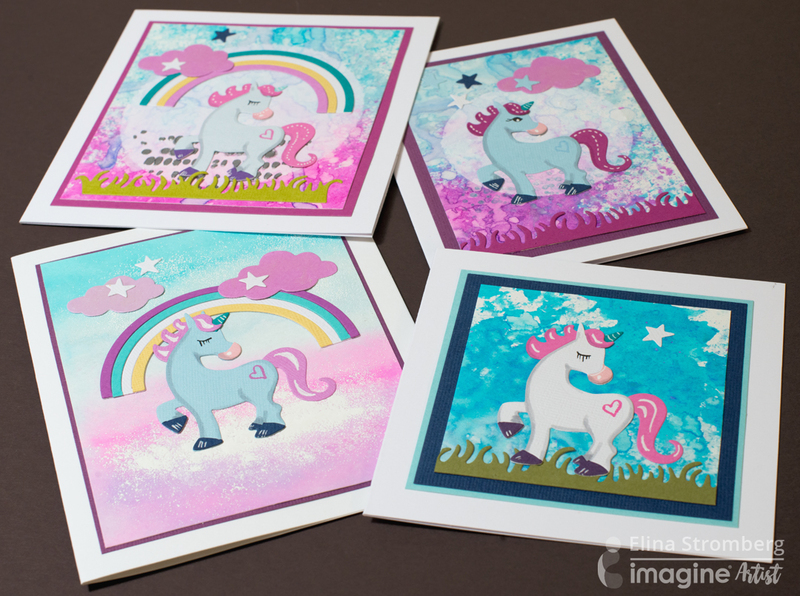 These unicorn cards gave me the opportunity to play with my favorite Fireworks Shimmery Craft Sprays. Watching the colors mix is on a piece of white paper is true crafting bliss! My cards have two kinds of backgrounds; the soft solid tones are created with brushing Fireworks on a wet paper, and the more textured ones I made using a plastic freezer bag. I placed my hand inside the bag, sprayed some ink on the plastic, and pressed the ink on the paper. While the color was still wet, I repeated the steps with new colors, letting the colors mix on the paper. The soft tone background is sparkling. To maximize the sparkle, I sprinkled iridescent embossing powder on the ink while it was still wet. When drying the paper with my heat gun, I also adhered the embossing powder on the card. Pink clouds also have a shimmering texture finish. Using a palette knife, I added Iridescent Purple Creative Medium on the die-cut clouds. Some backgrounds became a bit too busy, so I whitewashed the center using a Stipple Brush, white gesso, and a circle stencil. A thin layer of gesso is translucent and lets the background pattern show through. For adding opaque white details, I used white embossing powder. I sprinkled the powder on the dry background, and heat-set it by heating it from underneath. It’s a simple technique that can be used on most paper surfaces! If you enjoyed this project then let us know! Please comment below or share on social media! This entry was posted in Cards, DIFFICULTY LEVEL, DIY, Elina Stromberg, Embossing, INSPIRATION, Intermediate, PROJECTS, Techniques and tagged cardmaking, Cards, Crafts, Die Cutting, Fireworks Spray, Handmade, Memento, Paper Crafting. Bookmark the permalink. This is the cutest set of cards !!! And these dreamy pastel colors !!! Thanks for the gesso tip, pretty useful.